On 1 February 2019, His Holiness Patriarch Kirill of Moscow and All Russia, together with the Primates and representatives of the Local Orthodox Churches and an assembly of archpastors and clergy of the Russian Orthodox Church, celebrated the Divine Liturgy at the Cathedral of Christ the Saviour in Moscow. After the Liturgy the Primate of the Russian Church delivered the following address. Today’s solemnities, crowned by the conciliar celebration of the Divine Liturgy, are a visible testimony to the grace of God, much often and in many ways manifested to the Holy Church and her humble servants and faithful children. As I stand upon the ambo surrounded by my brothers the fellow Primates and representatives of the Local Orthodox Churches and as I look upon you all who have gathered here together and cast my mind back over the past decade of Patriarch ministry, I want to exclaim like the divinely-inspired prophet and psalmist David: “I will bless the Lord at all times: his praise shall continually be in my mouth… O magnify the Lord with me, and let us exalt his name together” (Ps 34:1, 3). Today we prayed together for “the peace of the whole world, for the welfare of the holy Churches of God, and for the union of all,” today we together gave thanks to God the Father, the Son and the Holy Spirit who is glorified in the Trinity “for all things of which we know and of which we know not, whether manifest or unseen,” today we together participated in the Mystery of the Eucharist – the common feast of love. On the day of my election to the Patriarchal Throne of Moscow, when beneath the vaults of this magnificent church the will of God was accomplished through the acts of the Sacred Local Council of the Russian Orthodox Church and I was behoved to accept the lot which had befallen me, it was with spiritual trembling that I became aware and clearly sensed that the cross lays at the heart of Patriarchal ministry. Now, as I stand upon the same sacred place, I can bear witness before God and you that great is the weight of this cross, and if there had not been help from above and if it were not for the prayers of the fulness of the Church, then no human strength would suffice to carry it. Throughout these years I have unfailingly felt the power of the prayers of the bishops, clergy, monastics and lay people; I have felt and realized that it is these prayers that have sustained my feeble strength and helped me to carry out my ministry with a complete awareness of my responsibility before God and people for all that happens in the life of the Church and in the spiritual and moral life of our contemporaries. I would like to express my special thanks to the Primates of the Local Orthodox Churches, to those who are present here today and to those who for whatever reason could not come to Moscow. It is a great honour and joy for me to labour with the renowned First Hierarchs, to strengthen Orthodox unity, to safeguard God’s Church from false teachers and division, to come to the defense of persecuted Christians, to “sing unto the Lord, bless his name; show forth his salvation from day to day” (Ps 96:2). Praise be to God for the past decade of the life of the Russian Church, for the ministry and labours we have carried out together, for fair share of contribution of each person – from the Patriarch to the lay persons – into the common cause of bearing witness to Christ Crucified and Risen before those who are near and those who are afar. 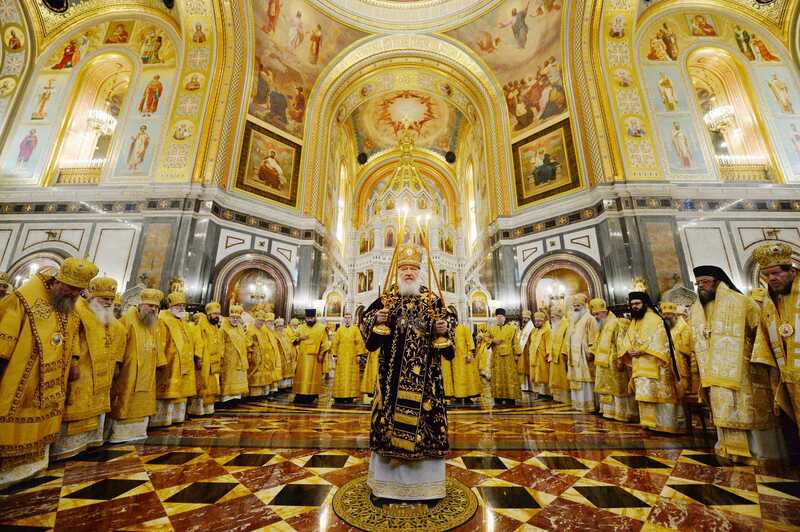 All that happens within the Russian Orthodox Church undoubtedly has an educational, missionary and social significance. And indeed, much is being accomplished for the first time in the thousand-year history of Christianity in Russia. However, the Church’s mission has always been and will be unchanged: to save, enlighten and sanctify every person who comes into the world (cf. Jn 1:9). A great field of activity lies before us: together we are called to vindicate the solid foundation of the canonical norms of church order, to strengthen Orthodox unity, to take advantage of all opportunities of common creative labours for the glory of God, for the good of the Holy Church and for the benefit of our contemporaries, many of whom have not yet come to “know the truth” (Jn 8:32) and still continue to err in the darkness of ignorance, to worship false gods and be tempted by illusory values. It is to these people that we must direct our Christian preaching, bring to them the Divine word of love, mercy, forgiveness and peace, show an example of a different life – a life transformed by the ideals of the Gospel. I hope that we will continue to ardently pray together and diligently labour to “do what we ought to have done” (Lk 17:10) and bring forth fruit a hundredfold. And may God Almighty help us in this. In placing my firm hope in the mercy of the Creator and the intercession of the Queen of Heaven, I will henceforth, should the chief Shepherd permit it, with humility and patience carry the cross of Patriarchal ministry which has been placed upon me. God alone knows how difficult this labour is, what strength, exertion of mind and willpower are demanded by this ministry, how aches the heart of the Patriarch who takes upon himself responsibility for the Church, “which the Lord has purchased through his precious blood.” Yet at the same time I would like to assure you that for me, as for the apostle and evangelist John, there is “no greater joy than to hear that my children walk in truth” (3 Jn 1:4). Therefore, I exhort you all with the words of the apostle: “Watch ye, stand fast in the faith, quit you like men, be strong. Let all your things be done with charity” (1 Cor 16:13-14). “The name of our Lord Jesus Christ may be glorified in you, and you in him, according to the grace of our God and the Lord Jesus Christ” (2 Thess1:12). Amen.